First, there was a children’s book. Then, there was a whole fantasy world waiting for people to find its written form. Not long after, Warner Bros. came up with the excellent idea to turn J.K. Rowling’s novels into a movie, or better yet, a franchise. But what really started the avalanche was the very first “Harry Potter and the Sorcerer’s Stone.” This film not only marked a new century of awesome movies, but was also the spark that ignited the popularity the boy wizard enjoys to this day. Harry Potter (Daniel Radcliffe) is an 11-year-old lad living in London with his mean aunt, her ignorant husband, and their abusive son. Our protagonist’s parents died in a car crash, so he’s basically stuck with this wonderful family. Until he gets chosen as a student for Hogwarts School of Witchcraft and Wizardry, that is. After his relatives fail to keep him from leaving, Harry’s magical adventure begins. If finding the train platform 9¾ wasn’t exciting enough, the magic ceiling at Hogwarts’ dining hall certainly did the trick of amazing the audience. While getting to his new school, our hero meets fellow students and future best friends Ron Weasley (Rupert Grint) and Hermione Granger (Emma Watson). After all three of them get accepted into House Gryffindor, Harry and his buddies officially begin their first year as wizards. During the movie, young Potter learns many things both about the world of magic and about himself. Many characters explain different things to Harry along the way, such as how magic works, how his parents actually died, and the fact that he actually has a mortal enemy. He-Who-Must-Not-Be-Named is never completely shown in the film, but his menacing presence is certainly felt when the scar on Harry’s forehead starts burning him or when we realize he’s been hiding in plain sight all along. Ultimately, the boy wizard and the ominous villain have one final showdown before Harry Potter defeats his nemeses and discovers the Sorcerer’s Stone, an object of great power, is actually in his pocket. 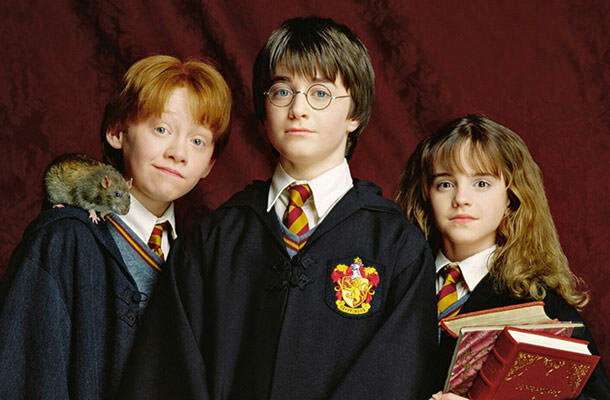 Despite the fact that nobody would’ve guess what this child movie will one day grow into, “Harry Potter and the Sorcerer’s Stone” managed to earn over $90 million on its opening weekend, only to amass a total of $317 million on a global level. It’s hard to imagine what the world would look like if Warner Bros. had stopped on the first J.K. Rowling book. Luckily for us, the success of “Harry Potter and the Sorcerer’s Stone” was just the beginning of the movie series which by end gave birth to a total of seven sequels. Although this was just a movie for kids, it launched not only one the most successful franchises in the world, but also the careers of the now well-known Daniel Radcliffe, Emma Watson, and Rupert Grint.